We decided to add some samples captured with the Samsung Galaxy Note 3's camera. To start off the Galaxy Note 3 has a 13 MP camera capable of 4128 x 3096 stills in the native 4:3 aspect ratio. It's supported by a powerful LED flash to aid it in low light conditions and has many software additions like Dual shot, Panorama, Rich Tone (that's HDR in layman's terms), touch focus, etc. The Samsung Galaxy Note 3's camera sensor probably derives from the Galaxy S4 and we're happy to say carries the latter's excellent image quality entirely. Images come out very sharp with great levels of detail, low noise, superb contrast and generally look great. We won't be diving too much into the quality as we save that for the full review but even with this prototype we doubt image quality would get any sweeter than it already is. HDR stills come out great as well. Samsung manages to squeeze detail out of every shadow by exposing every area in the scene but the end result doesn't have that over-exposed, over-sharpened, too unrealistic look. Images have pleasant detail, the sky is nicely accentuated and adds a solid dramatic look to images. 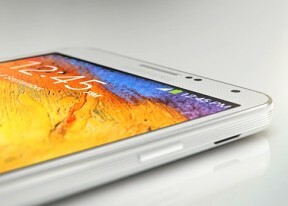 As for video, the Snapdragon 800-powered Galaxy Note 3 is capable of not only 1080p FullHD capture but also 2160p 4K video. It takes up a lot of space on the device, naturally, but also carries the very high bitrate of around 47 Mbps with a constant framerate of 29 fps. Audio has a bitrate of 121 Kbps with two channels (stereo) and a sampling rate of 48 Khz. Here goes a sample from the Samsung Galaxy Note 3. We also shot a 1080p FullHD sample. It has a bitrate of 17 Mbps and a 30 fps framerate. Audio is recorded in stereo with a bitrate of 127 Kbps and a sampling rate of 48 Khz. 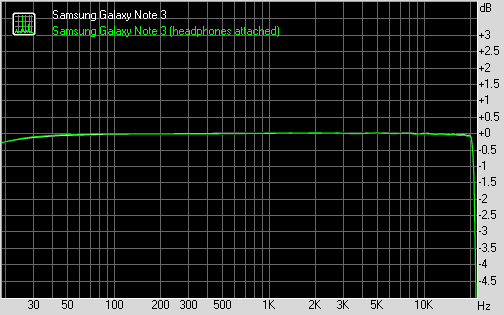 The Samsung Galaxy Note 3 showed exceptionally clean audio output in our audio quality test. The phablet posted some of the best scores we have seen in both parts of the test and garnished them with decent volume levels. It's not the loudest we have seen, but it's loud enough for 99% of the occasions. Impressively, there's virtually no distortion when you plug in a pair of headphones. Except for the minor bump in stereo crosstalk the output is barely affected.